Robbin Milne is a California painter and studio artist. She is associated with the Arts Benicia community, San Francisco and Berkeley, CA. She has exhibited her work in the Bay Area during the past 15 years in solo as well as group shows such as the Oakland ProArts Annual Open Studios, Arts Benicia Auction, Arts Benicia Open Studios. Robbin has also been seen in other venues including the Benicia Library Art Gallery, Orinda Art Gallery, Bedford Art Gallery, Sebastopol Arts Center and other venues in the area. Her work is in Bay Area private collections: In Napa and the South Bay areas, including Filoso/Obrien of Oakland and the Heydlers of Danville, now in Germany. Collectors abroad include Canada, France and Italy. Ms. Milne received the Ralph DuCasse Award for Academic Excellence in Studio Arts, and completed her BA in Studio Art at Mills College, Oakland California. She was born in Lake Charles, Louisiana in 1957. 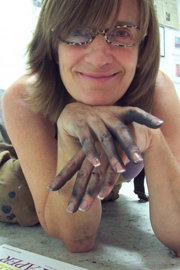 She continues to offer art instruction and appreciation, and has worked in the National Institute of Arts and Disabilities with adults.